Hello everyone, Ann Blair Kennedy here; I’m a clinical Assistant Professor at the University of South Carolina School of Medicine Greenville and the Director of the Patient Engagement Studio. At the school, I have been charged with crafting and delivering the cultural competence/humility curriculum, which includes topics such as social determinants of health, health disparities, implicit bias, and health equity. 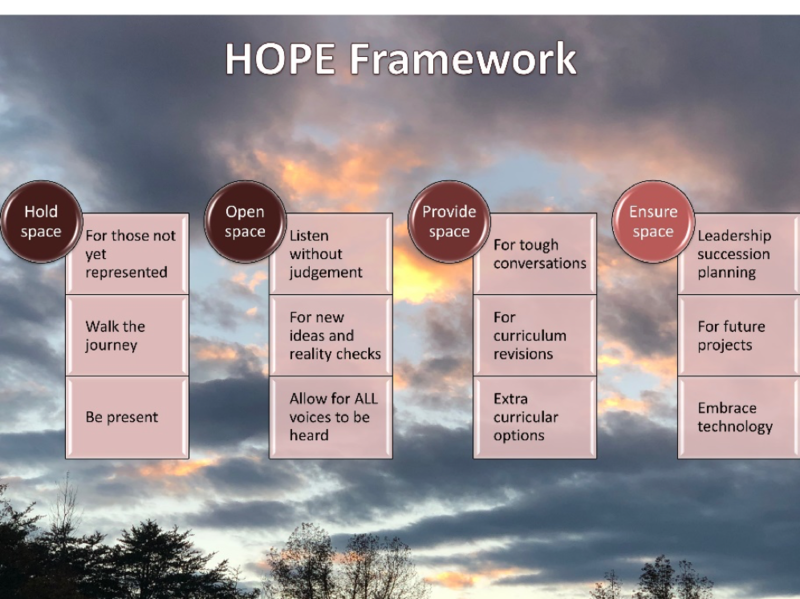 In this post I explore ways faculty or other stakeholders can use the HOPE framework to create space for diversity and inclusion innovation with students. I developed the HOPE framework after reflecting on Lessons Learned from working with students to create the Student Advocates for Diversity and Inclusion (SADI). The group joined leaders of several student interest groups with the desire to drive change within the curriculum and the environment. In under a year, students were able to implement changes in the curriculum, create an extracurricular program, and engage with leaders of the Academic Health Center. Hold Space: Simply being present with students and being willing to walk the journey with them when dealing with the tough and complex topics that surround diversity and inclusion is a place to begin. Faculty mentors must also be aware of and become advocates for the populations that may not have a student champion. Open Space: To open space we must be willing to listen to students, even when our own deficiencies or perceived deficiencies are the topic of conversation. Also, having open space allows for dissenting opinions and hopefully all viewpoints so no students feel excluded. Listening without judgement may allow for more objective evaluation of new ideas and judicious feedback on those ideas. Provide Space: Finding ways to creating safe space for tough conversations is an important step; the Rad Resource below has been particularly helpful in this area. Faculty must be willing to review and possibly change the curriculum for greater diversity and inclusion topics. Finally, supporting and helping to facilitate extracurricular activities shows buy-in from faculty which may help to build trust with students. Rad Resource: Using Diversity Thumballs from Trainer’s Warehouse has been a non-threatening way to start tough conversations in class. Students get into small groups and toss this 6-inch soft, foam “soccer” ball with thought provoking diversity questions (e.g., How do you respond to jokes that are demeaning or derogatory?) printed in each hexagon. This has created an avenue for deep discussions and personal reflection for them. Ensure Space: Prepare for sustainability and future innovation, this could come in the form of technology or future creative projects. Also, work with students to create leadership succession plans to bring new and diverse ideas and maintain membership in the committee. The HOPE framework described here is one way faculty and other stakeholders can create an environment that may help build trust, allow for open dialogue, and bring forth cultural changes that empower students to share their views and enhance their education around the topics of diversity and inclusion.